To access app settings, press on the gear icon on the bottom-right of the home screen. There are a number of settings options that you may want to configure in order to get the app logging what you would like. Account Settings: Allow you to manage and access general account information. Sign out: It's used to unlink a device from the account it's attached to and stop tracking. You should only use this if you no longer wish the device to log time at all. If you just want to stop logging temporarily, use the “Pause Logging” device option listed below. Password, Billing, Privacy: It will open the Account Settings page of the RescueTime website in your default browser app. There you can find information about these topics and make changes. Troubleshooting: It will open a page of diagnostic data which RescueTime support staff may use to help you solve problems with your app. Tracking Options: Allow you to control what the app logs and what functions are enabled. Pause Logging: It will disable activity logging on the phone until the option is unchecked in the future, at which time logging will resume. 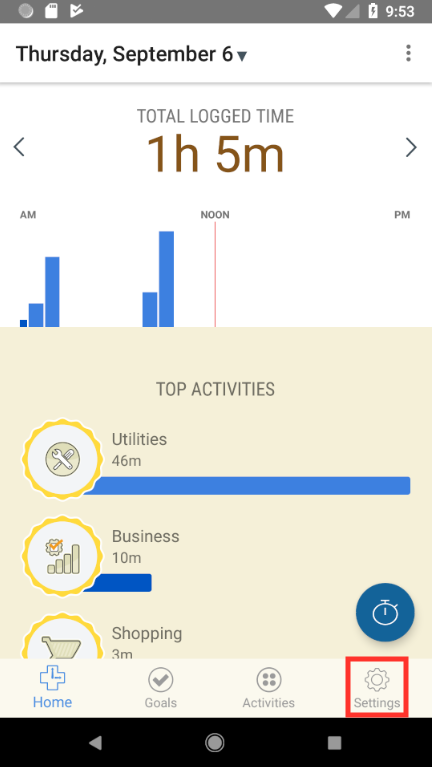 Track Apps: Tracks the usage of apps when the phone is awake. Track Sites: Allows you to see time broken down by website for browser activity. If this is not checked, your browsing time will be compiled together into a single entry for the browser app. On some versions of Android, notably Android 9.0 "Pie" and later, this feature is unavailable. 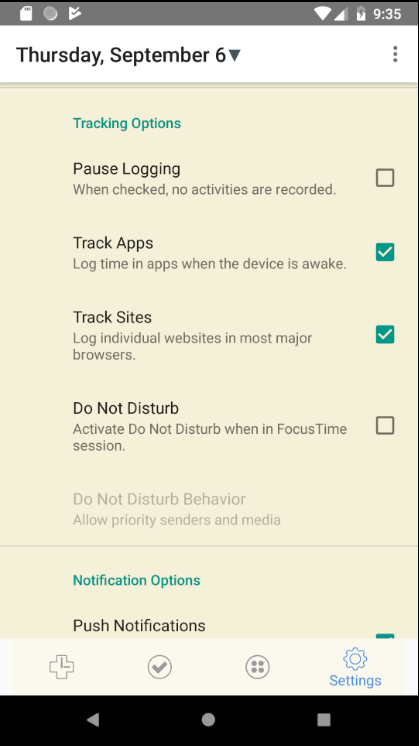 Do Not Disturb: It will put your phone into Do Not Disturb mode during a RescueTime FocusTime session. This feature is available in Android 6.0 "Marshmallow" and newer. Do Not Disturb Behavior: If "Do Not Disturb" is enabled, this becomes active and lets you customize the do-not-disturb style: Allow priority senders and media, allow alarms and some media, or enforce total silence. Push Notifications: Enables the presentation of RescueTime Alert notifications (sent by RescueTime servers) on the device. Persistent Tracking Notification: Show's today's total time and productivity pulse as a sticky system notification. When enabled, RescueTime keeps running as a service, and data sync to our servers will happen more frequently, especially when the device is not charging. 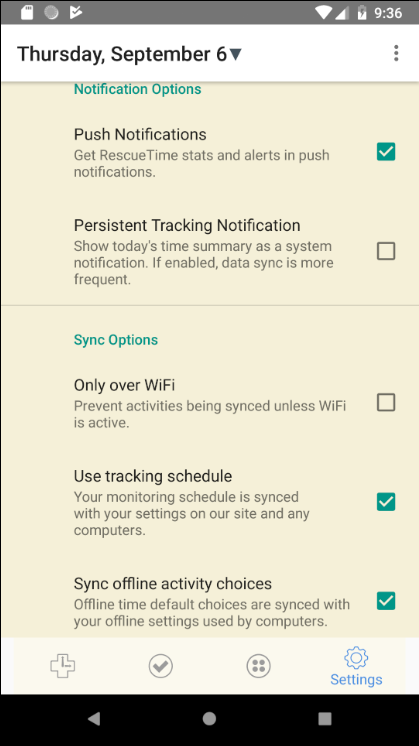 Sync Options: Determines the coordination between certain settings in your RescueTime account and the Android app. Only over WiFi: Restricts the sending of RescueTime data to times when you have a WiFi connection. The activity log files that RescueTime sends are small, but you can choose this option if you want to minimize the impact on your data plan. Use tracking schedule: Puts into effect the logging schedule you have established in your Privacy settings on the RescueTime website. If this is not selected, the app will log 24x7 by default. 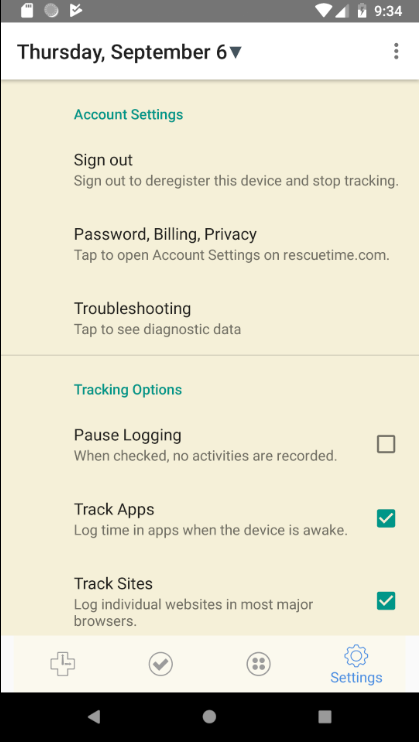 Sync offline activity choices: Imports your Offline Time Entry labels from the RescueTime website so that they appear automatically as submission options when using the Android app’s Offline Time entry feature.